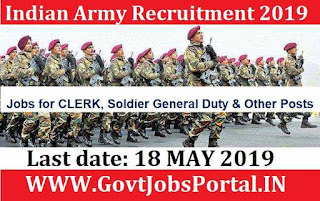 Indian Army Recruitment 2019 for Short Service Commission Technical Officers. All Indian unmarried Male as well as Female candidates can apply for this Indian Army recruitment process 2019. This is a technical entry scheme so only BE/B.Tech(Engineering) pass candidates can apply for these Government jobs as an officers. Windows of Army Personnel who have completed their engineering degree can also apply for this Indian Army technical entry scheme 2019. This course will be start’s in Oct. 2019 at Officer Training Academy. The process for applying this Indian Army technical entry scheme 2019 will be online and currently is active. So those who satisfied all the eligibility conditions which we explained below in this job posting can apply now online up to 21st Feb. 2019. After this Date the link will be close for applying online. 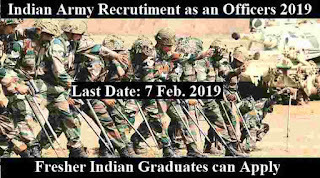 Please do not wait for the Last date for applying this Indian army recruitment 2019 as a technical officers. During the last few days for applying online server of Indian army website creates lots of problem, so apply as soon as possible. Read out the complete article below for more information. Pay Band: Rs.56,100 – 1,77,500 per Month. Educational Qualification Requirement: All applicants who have successfully passed in their Engineering degree can apply for this Indian army recruitment 2019. Those who are in the final year of their engineering degree can also apply for this recruitment process 2019. 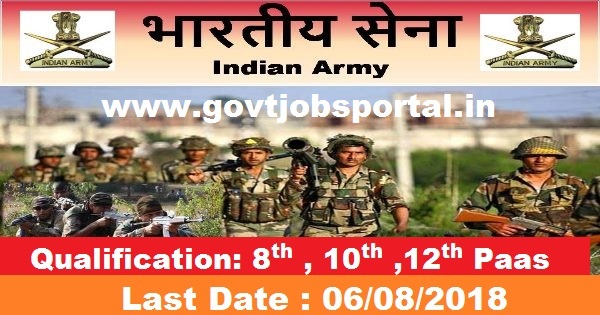 Age Bond: Applicants age must be in between 20 years to 27 years for applying this Indian army recruitment 2019. Qualified and concerned applicants have to pay ZERO application fee for applying these army jobs as an officers. 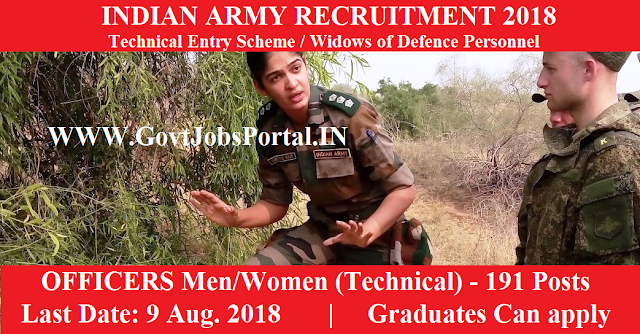 Indian Army launched an official page for applying this Indian army Technical entry scheme 2019. So those who are interested in these Government jobs under Indian army have to apply online from 23rd Jan 2019 to 21st Feb. 2019. 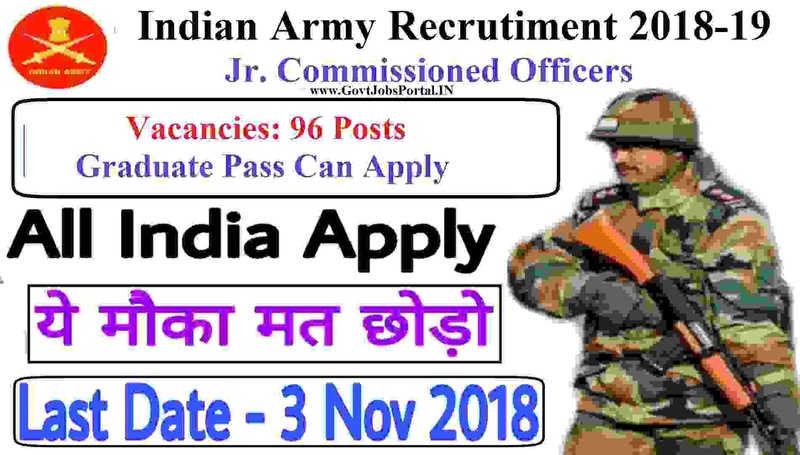 After the last date the online form link will be disable so apply as soon as possible for this Indian army recruitment 2019. All Indian candidates can apply online through Indian army official website with their personal and educational detail. Check IMPORTANT LINK section below for Advertisement as well as online Link for applying. 21st Feb. 2019 is the Last Date to apply. At this time a fresh Declaration has been published by Indian Army Recruitment department related to the NCC Entry Scheme 2019. Those who are looking for the Government jobs under Indian Défense department can apply for this recruitment process to become an officer under Indian Army. Graduates applicants with NCC certificate are eligible for applying these army jobs as an Officers 2019. 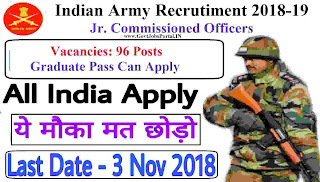 Indian Army Job Applications are demanded from male as well as Female Indian residents possessing essential educational qualifications and age, as prescribed below in this article, for the recruitment to the post of Officers, in Indian Army. More info we shared below in this job article related to the various criteria & conditions. We took this information from the official website of Indian Army. They shared the official PDF file whose link we also shared at the last under IMPORTANT LINK section. Read the whole post carefully before applying for these army jobs as an NCC officers. Number of Vacancies: 5 Posts. Indian Army Recruitment department recruit Indian fresher graduates candidates for JCO posts time to time. Here we come to know about the new notification by Indian Army department in which they are again going to recruit Indian candidates for JCO Posts. So those who want to serve their nation can apply for these army jobs for Jr. commissioned officers. 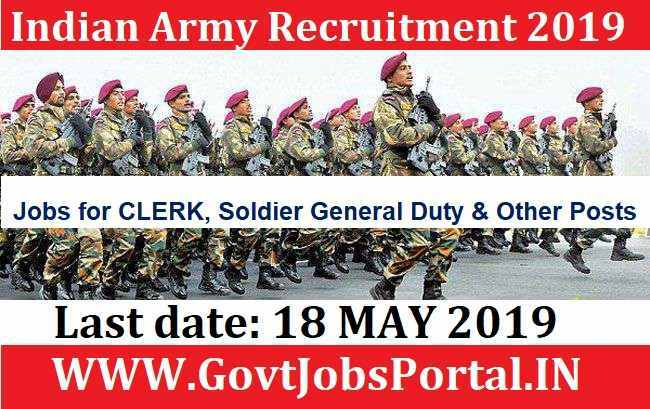 Indian army is inviting all Indian eligible and interested candidates to apply for these Government jobs through a proper online channel. There are total 96 vacancies for Jr. Commissioned Officers which are going to be filling up through this Indian Army recruitment process 2018. More information related to these Govt jobs for Jr. Commissioned Officers in Indian Army is given below in this article. Read the whole article carefully before applying online for these Army jobs 2018. We explained everything about his recruitment process below in this post. Latest Government job notification is out to recruit Indian fresher candidates as soldiers under various streams through this Indian Army recruitment rally July 2018. Indian Army recruitment department is inviting all Indian candidates to appear in this rally to grab a Army job in India. This is the best way to sever your nation. Those who want to work for Indian Army can apply for this recruitment rally 2018. Indian Army is looking to fill up the following posts “Soldier Technical, Soldier Technical (Aviation/ Ammunition Examiner), Soldier Nursing Assistant, Soldier General Duty & Soldier Tradesman, Soldier Clerk/ Store Keeper Technical” through this Indian army recruitment process 2018. Those who are eligible for applying these Army jobs in India can apply online up to 06th August 2018. In the article below we explain various detail related to the education qualification and other eligibility conditions. The all Indian 12th pass fresher candidates can apply these Army jobs in India. This is a great opportunity to get a Government job through this Indian Army recruitment 2018. The interested Indian people for these Army jobs who fulfill all the eligibility criteria given below can apply for this INDIAN Army Recruitment 2018. 12th pass candidates from all over India in“Science” stream only can apply for this Technical Entry Scheme 2018. More information related to these Army jobs in India is given below in this post. Read it carefully before applying for this Indian Army recruitment 2018. 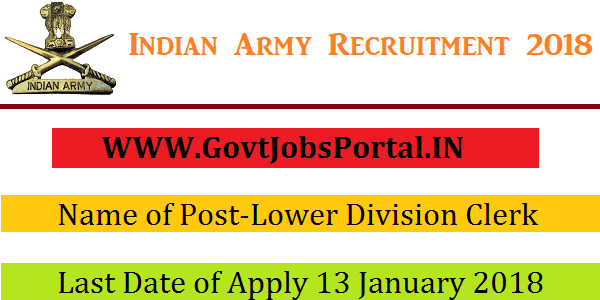 Join Indian Army is going to recruit fresher candidates in India for Lower Division Clerk, Tradesman Mate Posts. So, those candidates who are willing to work with this organization they May apply for this post. Last Date of Apply 13-January-2018. Total numbers of vacancies are 291 Posts. Only those candidates are eligible who have passed 12th Class Pass or equivalent from a recognized board. Indian citizen having age in between 18 to 25 years can apply for this Join Indian Army Recruitment 2018. 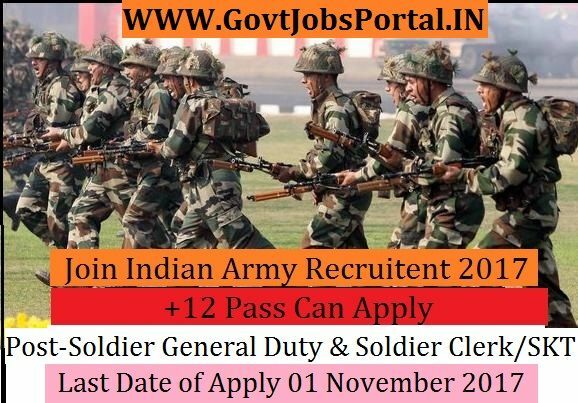 Those who are interested in these Join Indian Army jobs in India and meet with the whole eligibility criteria related to these Join Indian Army job below in the same post. Read the whole article carefully before applying. Educational Criteria: Only those candidates are eligible who have passed 12th Class Pass or equivalent from a recognized board. What is the Process for Selection this ARMY job? Join Indian Army is going to recruit fresher candidates in India for Soldier General Duty & Soldier Clerk/SKT Posts. So, those candidates who are willing to work with this organization they May apply for this post. Last Date of Apply 01-November-2017. Total numbers of vacancies are Not Mention. Only those candidates are eligible who have passed Matric with 45% marks in aggregate and 33% marks in each subject & Should have secured 50% marks in each subject and 60% marks in aggregate in Class XII. 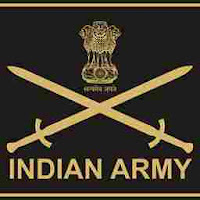 Indian citizen having age in between 17 to 23 years can apply for this Join Indian Army Recruitment 2017. Educational Criteria: Only those candidates are eligible who have passed Matric with 45% marks in aggregate and 33% marks in each subject & Should have secured 50% marks in each subject and 60% marks in aggregate in Class XII. Age Criteria: Candidates age limit should to be possess minimum age 17 years & maximum age 24 years.